See why I love my children so much? They are such delightful people, and they were exactly right. Why do the old grads like Steve and me make pilgrimages back to the Loveliest Village on the Plains? Because of what’s the SAME. The traditions! We learned our lesson the hard way and spent the rest of the weekend reminiscing and enjoying the tried and true. The top picture shows the back of my t-shirt purchase on that day. Notice that “rolling the trees on Toomer’s Corner” was featured because their fate had been so much a part of the news since the previous winter’s vengeful poisoning by the disgruntled fan of a rival team. In the next picture, you can see for yourself how the trees at Toomer’s Corner were faring. Look closely at the tops, and you’ll see some sick-looking yellow and brownish leaves, especially when you compare their color to the trees behind them. Sadly, those trees have since been removed. I always enjoy walking past Langdon Hall, the site of my Senior Piano Recital given in December of 1971. I started my college journey at Samford, studying with my much-beloved teacher Dr. Betty Sue Shepherd. But, I gave that up to marry Steve and ended up here. I’d do it all over again, dear Steve. This is Gargis Hall where many of my music classes were held. It was old then, so it’s REALLY old now. 🙂 Stately architecture, though, don’t you think? And there’s a glimpse of Samford Hall’s iconic clock tower in the distance. 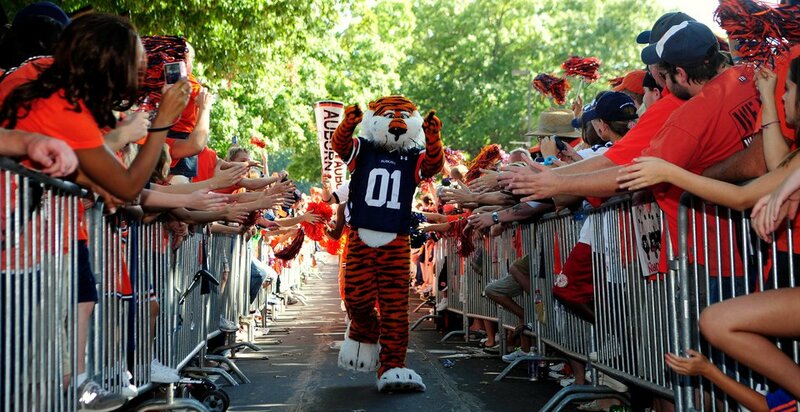 In this photo, Steve and I are headed to the game, and you can see Jordan-Hare Stadium in the background and Haley Center. I hear that they’re planning to tear down the Haley Center. I guess that piece of landscape will change soon — hopefully for the better. Here is Aubie — award-winning mascot — entering the stadium before game time. Our grandson Luke aspires to “be Aubie” when he gets to college. Wouldn’t that be fun?? With 30 seconds left in the game, the score was 42-38 and thankfully, it stayed that way to the end. It was another day of chanting the cheers, singing the fight song, and pulling for the Tigers. This is not the place to color outside the lines. We’ll stick more closely to what we know and love next time — hopefully in the not-too-distant future. War Eagle, everybody! P.P.S. This coming Saturday Steve will be taking our 3 oldest grandsons to Auburn for a game. Memories will be made. Traditions will be passed down.